For some two centuries, scholars have wrestled with questions regarding the nature and logic of history as a discipline and, more broadly, with the entire complex of the "human sciences, " with include theology, philosophy, history, literature, the fine arts, and languages. The fundamental issue is whether the human sciences are a special class of studies with a specifically distinct object and method or whether they must be subsumed under the natural sciences. German philosopher Wilhelm Dilthey dedicated the bulk of his long career to there and related questions. 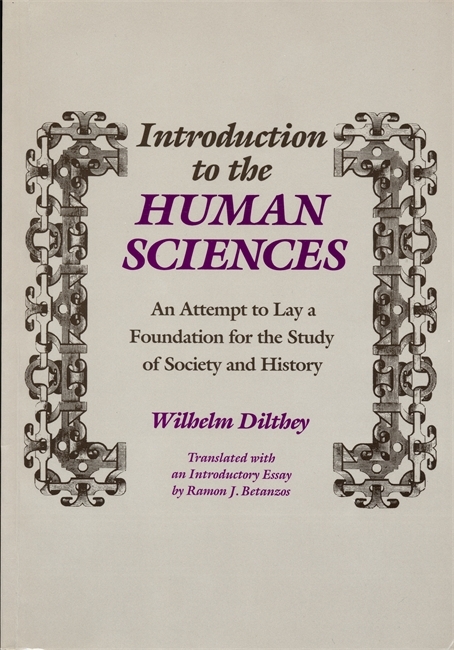 His Introduction to the Human Sciences is a pioneering effort to elaborate a general theory of the human sciences, especially history, and to distinguish these sciences radically from the field of natural sciences. Though the Introduction was never completed, it remains one of the major statements of the topic. Together with other works by Dilthey, it has had a substantial influence on the recognition and human sciences as a fundamental division of human knowledge and on their separation from the natural sciences in origin, nature, and method. As a contribution to the issue of the methodologies of the humanities and social sciences, the Introduction rightly claims a place. This is the first time the entire work is available in English. In his introductory essay, translator Ramon J. Betanzos surveys Dilthey’s life and thought and hails his efforts to create a foundational science for the particular human sciences, and at the same time, takes serious issue with Dilthey’s historical/critical evaluation of metaphysics. Ramon J. Betanzos, a Ph.D. from the University of Michigan, is an assistant professor in the Humanities Department at Wayne State University.